04.05.2017 | Cancon has ended – thank you for all! Some numbers on Cancon communication. 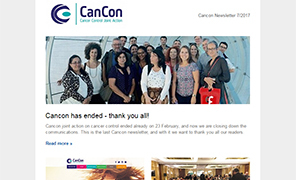 Cancon Extranet will be closed on 5 May. The views expressed on this site do not necessarily reflect the views of European Commission.